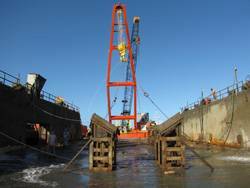 RESOLVE Marine Group, Inc. successfully refloated the Perseverance dry dock in San Juan, Puerto Rico on October 27. The dry dock sank on September 29 during maintenance/refit operations. During the sinking, the dry dock’s internal pumping system became inoperable due to flooding of the dock’s control station. Also, internal damage sustained during the sinking event made several of the internal compartments common, degrading the stability of the dry dock.